Sizing is the most important segment of weaving preparatory process. It is the process of applying protective adhesive coating on the yarn surface. After winding and warping, sizing of yarn is done during beam preparation. Sizing is done by applying various types of size materials on the yarn. Better the quality of sizing higher the weaving efficiency & vice versa. In fact without sizing, in most of the cases it is almost impossible to run the weaving process. 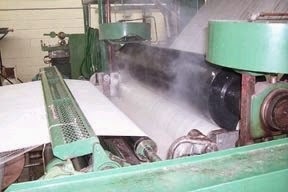 During application of size materials steam is needed. Flowchart of sizing for warp yarn preparation is given bellow.